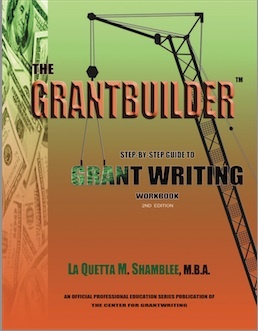 Only $35.00 for the grant writing workbook that will teach you how to find and raise millions from government, foundation and corporate funders. Professional career entails responsibility for grants research, writing, management and contractual compliance for educational, health and social service programs with annual budgets up to $6.3M. Includes multi-site, multi-department programs funded by government (federal, state, county and local) and foundation sources; supervisory responsibilities for up to 73 staff, nine departments, 12 funding sources; interim reporting and invoicing (narrative and statistical); program design and curriculum development, staff and leadership training; fundraising, including special events, sponsorship solicitation (cash and inkind from individuals and businesses) and grant writing; community outreach and marketing; volunteer and intern recruitment and supervision. 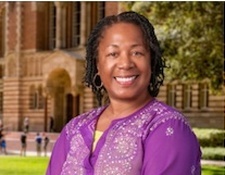 Grant review panelist (County of Los Angeles, Cities: Los Angeles, Pasadena and Long Beach. Professional writings include press releases, web content and more than 500 articles on business, entrepreneurs, nonprofits, management and leadership.